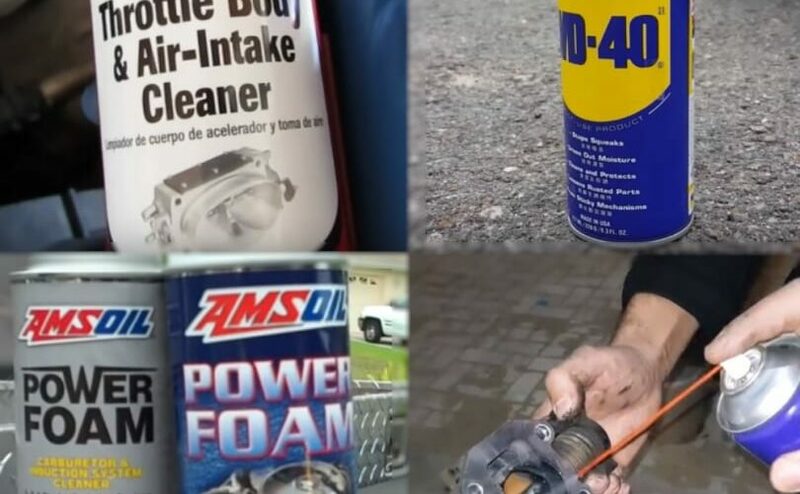 Best Throttle Body Cleaners Reviews: Top-5 in April 2019! How To Choose The Best Throttle Body Cleaner – Buyer’s Guide! All engines, whether they have EFI systems or standard engine components, require an occasional clean, especially if you are into performance driving or long road trips. The two most common cleaning operations include fuel injection systems and throttle bodies. The fuel injection systems are cleaned by professional services, and best left at that. Throttle body cleaning is a much simpler operation and can be performed by anyone with a basic understanding of car engine mechanics. Cleaning a throttle body will improve the car’s performance, will improve MPG, and will improve power and torque performance. The best way to notice a declining throttle body is by feeling for a rough idle, stumbling initial acceleration or even stalling. Take peek inside your throttle body, notice how full of gunk, resins, carbon deposits and unknown substances that just like to cover hidden surfaces. In this article, I present you with two throttle cleaning fluid options and three throttle cleaning brush sets. Cleaning fluids are essentially different formulations of Methanol, Topline and Acetone with a CO2 pressurized gas as venting agent. Throttle body cleaners come with no Naphtha content, as such, they do not leave a residue. Brushes are even more basic and they come in steel variations using nylon. The top rated brush sets will come with at least 15 pieces of varying diameters including brushes and needles. Here is the list of the 5 top rated throttle body cleaner kits on the market today. The CRC cleaner is a basic acetone cleaner that comes in aerosol form. As such it is highly flammable and must be stored in a cool and dark place. This brand is used for cleaning throttle bodies and eliminates the gummy accumulations with ease. One sprays and wait a few moments, then apply the brushes. A standard acetone solvent aerosol can that is easy to apply, it evaporates fast so don’t wait too long, apply, wait a few seconds and then use the relevant brushes. 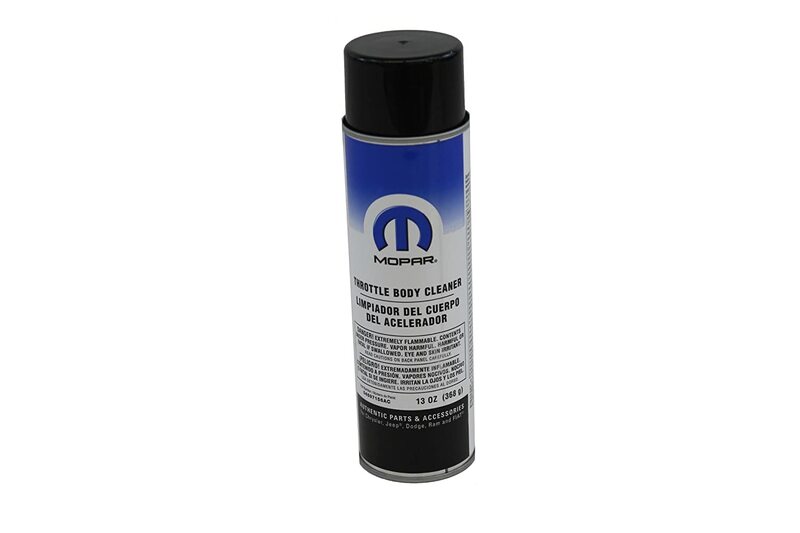 MOPAR 4897156AC Throttle Body Cleaner is an acetone based product that is used to clean just about every motor component that you want. It is good for metal and PVC components and once sprayed will evaporate fast. This is another standard acetone based formulation that cleans engine parts with a spray application, just bring the brushes and get to work. This homEdge set is made from high density packed nylon that is twisted to prevent hair loss during application. The steel is am 18/8 stainless steel alloy and, the set comes in a convenient and corrosion resistant aluminum case. This is a comprehensive kit, it comes with different diameters for matchins many applications, including 10 cleaning needles + 5 brushes. The overall length is 4.53inch (115 mm). 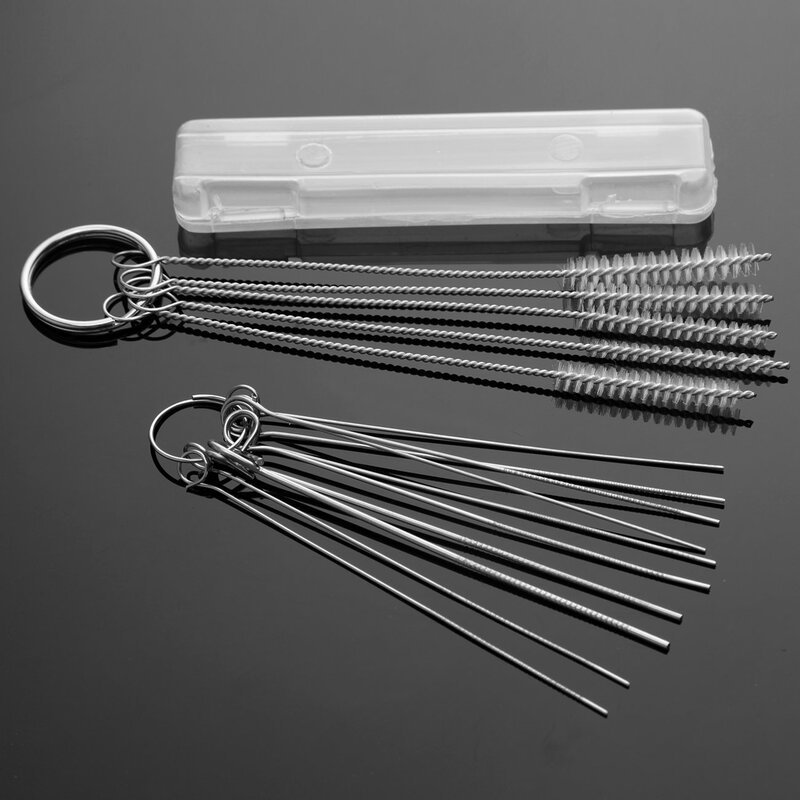 The cleaning brush diameters are 2mm, 3mm, 4mm, 5mm, 7 mm, and the cleaning needle diameters are 0.4 mm, 0.5 mm, 0.6 mm, 0.7 mm, 0.8 mm. A classic setthe, price e is exceptional and, a must-have item. The Wedfeir set comes with 15 components, these include 10 needles and 5 brushes. 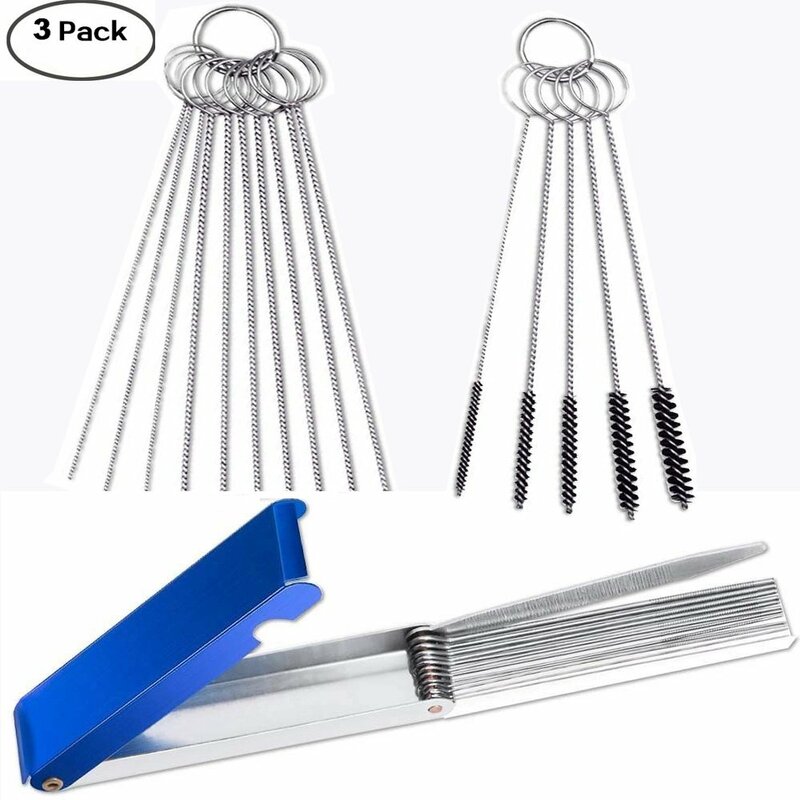 The brushes are made from stainless steel with nylon bristles and the bristles are fasted in a spiral fashion to eliminate hair loss, as well as make cleaning much easier. The brushes are made of 304 stainless steel and their length is 115mm/4.53, and their diameters are 2mm, 3mm, 4mm, 5mm, and 7 mm. The set comes with a steel carrying case for extra protection from harm, and is 10.2 x 2.3 x 1.2cm/4 x 0.9 x 0.47in in size. 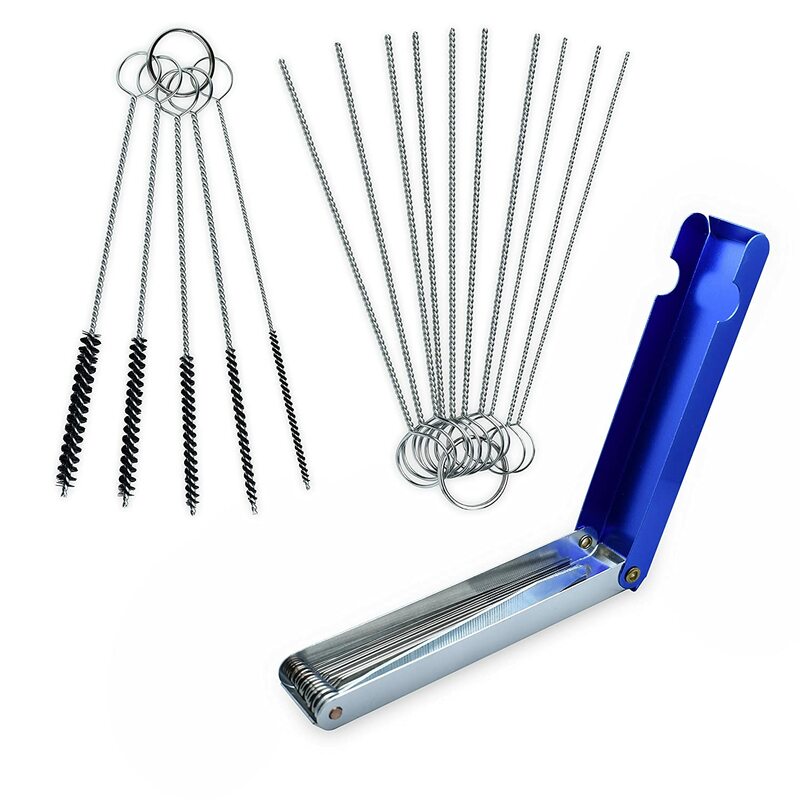 This is a great combo kit for many applications, the price is perfect and the kit is secured in a strong steel box. A great carry around for all mechnics. The Ridge yard is a budget-friendly set, yup, even here you get one of those that costs half of a standard set. In this,s case is made of standard stainless steel with a key-ring holder for all the brushes and needles. There is also a plastic carry case. If you are budget restricted, then this is the best option for you, and this set is perfect for many applications, so don’t underestimate its performance because of its price. Cleaning a throttle body is not a big issue, while there are some throttle bodies that are hard to reach or open, you might forgo cleaning it yourself and taking it into the shop for cleaning. If your throttle body is easy to locate, and is easy to disassemble, then just remember that its made of aluminum, and the brushes are steel. When brushing, try not to led the brush shaft rub against the air intakes, since this will chaff them. Only allow the nylon contact. When using the needles, make sure you only insert them to remove the dirt, don’t scrape the sides. If you have an issue finding the throttle body, have someone sit in the cab and press the fuel peddle, then look for movement, that will be the throttle shaft that leads to the throttle body. The throttle body is attached to air-intake tubes, check which tools you need to disconnect these, label each connection before removing it, use a colored tape on the throttle body and the hose, so you match each one when returning it. Do not disturb or disconnect the electrical wires. Make sure you are not damaging any gaskets, or you will need to replace them. Put on your eye protection if you haven’t done so yet, and also your rubber/surgeon gloves. Spray into the air duct and use the brushes to clean the sides. Brush all the surfaces until they are clean, you will see the aluminum shine. Using the cotton wool and the oil, swab the throttle shaft slightly (don’t overdo it) and one drop of oil to the rotor too. Using the paper towels, clean up all residues and liquids from the engine surface that fell during the cleaning operation. Clean the surfaces of any tools and waster. Reattach the neghative tyo the battery. Sometimes engines will start a bit rough, but that’s common. After the initial ignition, the engine will start to perform better than before. Leave the engine running for a few minutes, and then take it for a test drive. You will notice that your engine now performs significantly better and your throttle reaction together with your overall control has improved.